This week, the sun has been shining and London is like a brand new city. We may be on borrowed time, but we've had a spring in our steps and a boost of Vitamin D for the first time in forever. 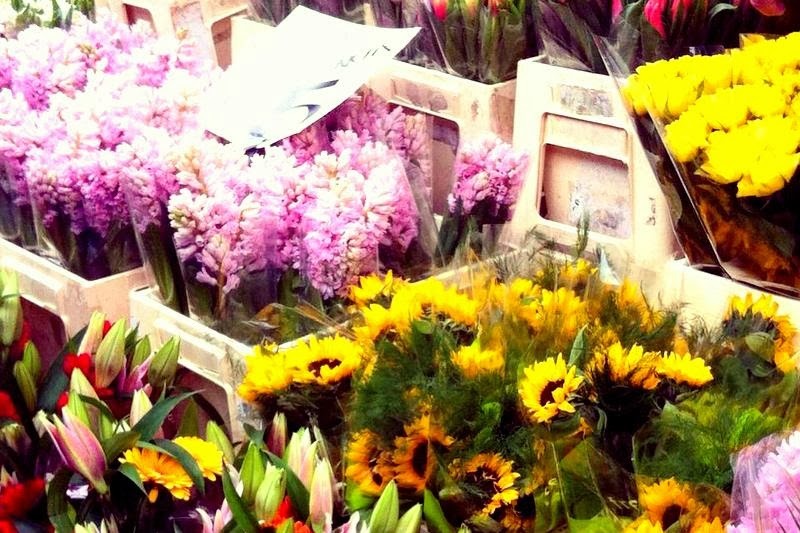 A sleepy Sunday spent perusing Columbia Road flower market (and bumping into the lovely Cat who writes over at Take Courage, one of my favourite blogs!) was the icing on a very smug little cupcake. I feel enthusiastic again, and couldn't think of a better time to debunk the macaron myth. There I said it. Contrary to common opinion, macarons are not impossible to perfect. There's a lot of literature agonising about temperature, air content, timings and more. I found that it's more a case of precision and patience. Macarons cannot be hurried, and do need a bit more love than your average bake. 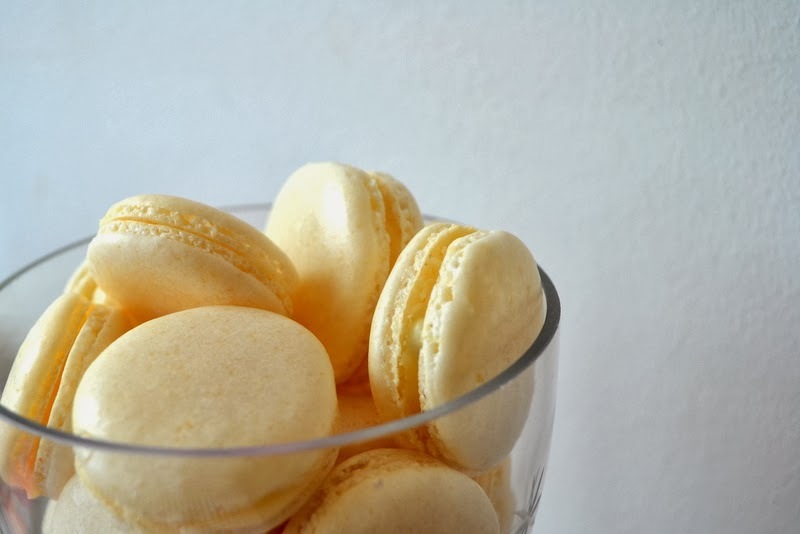 Here's my recipe for macaron success - Passion Fruit felt sunny, but you can fill these little beauties with whatever you fancy. Now is the time for precision. Preheat your oven to 130C. Line 4 baking trays with baking parchment, and mark 3cm circles on the other side of the paper (this feels tedious but you'll thank me later). Weigh out the almonds and the icing sugar exactly, then pass through a sieve to ensure the mixture is an even consistency. Clean a separate mixing bowl using half a lemon (this is to ensure any specs of dirt are removed). Add the egg whites and the salt to the cleaned bowl, then whisk into soft peaks. Once the whites are stiff enough to hold their shape, add the caster sugar 1 tsp at a time, whisking in between each spoonful to ensure the sugar is dissolved. Towards the end, add a few drops of gel colouring if using, and the orange essence. Add in the icing sugar and almond mixture. Using a plastic spatula, fold the two mixes together. Do this gently - you want to remove some of the air but not all of it, so it's better to mix slowly. The mixture is ready when it is shiny, combined and falls off the spatula into a ribbon consistency. Spoon the mixture into a plastic piping bag. Snip off the end, then pipe the mixture onto the prepared trays, using the circles you drew to ensure that each shell is the same size. Once the shells are piped, you need to leave them to rest, so that they can form a skin which will protect them from cracking when they rise in the oven. I leave mine for an hour to be safe, but they're ready once you can touch them lightly and not leave a mark. Bake in the preheated oven for 12-15 minutes. The shells are ready when you can peel them off the paper. Remove from the oven and transfer onto a wire rack to cool completely. To make the filling, whip the cream and icing sugar together until firm. Scoop the pulp from the passion fruits and stir through. Use this to sandwich two shells together. Wrap beautifully to give as a present. Great article! I have been struggling with macarons for ages. Last attempt went bubbly and chewy. You are inspiring me to give it another go!